The Waterblogger: Butte's "Insignificant Mountain"
The Mining City is surrounded by majestic and interesting landforms: the Highland Mountains, the East Ridge of the Continental Divide, the Big Butte and Timber Butte are all familiar spots on the skyline for the people who call Butte home. Mother Nature placed an equally imposing geologic signpost of the Summit Valley to the north and east. It shows up in many a photo, but sadly goes unrecognized by the majority. Rampart Mountain stands sentinel above the rich veins and strongly morphed topography of Montana’s greatest mining landscape, only nobody seems to know her name. Can I summon up a chorus of David Allen Coe’s “You Never Call Me by My Name”? Perhaps it is that she fails to bear a covering of trees, a snow-capped peak, a famous lighted letter, or a holy inhabitant like its topographical neighbors. Or maybe it’s because our sights from inside the city are just so trained to look in other directions. Regardless, the fact is as hard as the rock of which she’s made and as cold as the incessant winds that whip her: Rampart bears the notoriety of Butte’s insignificant mountain. With a summit of 7,789-feet, the treeless Rampart makes up an imposing, starkly contrasting segment of the Continental Divide, possibly the greatest surrounding The Mining City. How her name mostly escapes the masses is a dirty shame. With the exception of the Pipestone area and the Humbug Spires, it also bears some of the most spectacular outcrops that the Boulder Batholith formation has to offer. Aside her spartan beauty, Rampart bears some additional significance. The Continental Fault, a “young” phenomenon by geologic time standards runs along the western front (facing Butte). That’s why Montana Resources’ current operations are named The Continental Pit. The fault is also responsible for the steep escarpment that likely gave the mountain its name. (Note: look for an upcoming edition on The Continental Fault featuring an interview with Mike Stickney, Director of the Montana Bureau of Mines and Geology’s Earthquake Studies Office). The word rampart is defined as “a broad embankment raised as a fortification” or a “wall-like ridge” according to Merriam-Webster on-line. 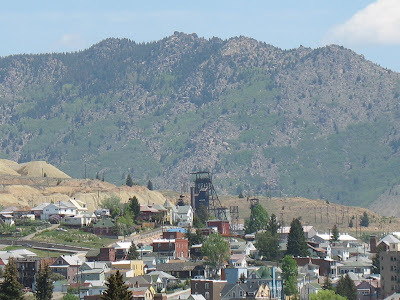 My 12-year old daughter and I recently hiked to the peak of Rampart and took in the most amazing view of Butte’s mining in its entire unappreciated splendor. “WOW,” is the one word that comes to mind. And despite the lack of trees, there was abundant sign of deer, elk and moose, probably feeding on the productive stands of aspen, bitterbrush and currants that cover the mountain, despite the fact you can’t see them from afar with your naked eye. In fact, there was a Boone & Crockett 200-class mule deer buck bagged on Rampart just a couple of hunting seasons ago. In my research and runabouts trying to find out more about Rampart, I also learned that the smaller mountain attached to Rampart to the south, the one that is currently being mined by Montana Resources, also has (soon to be had) a name: Sunflower Mountain. Sunflower’s final bloom will be the copper, molybdenum and silver she yields to the world economy and to providing good, reliable labor for the 350 miners of Butte until she’s gone. However, if the records are right, Butte doesn’t have to worry about losing its Rampart to mineral development. In addition to its new distinction as the “insignificant mountain,” Rampart owns the dubious title of being the center of the least productive mining district in The Treasure State’s storied mining history. “Although numerous prospects scattered through the area concentrated on vein mineralization, there has been little additional development even since 1935. Just one more reason, I guess, as to answer why Rampart has gone unnoticed. Quite simply, what you see is what you get. And for me, that’s more than enough of a reason for us to start calling her by her proper name. You never even call me by my name"